They're actually amongst the cheapest for a colour laser printer, particularly if you buy the high capacity, 6000 page ones. £60 (genuine OEM, from Cartridge People) for a 6000 page black toner cartridge is a good deal! This is a workhorse of a printer, designed for far more output than a standard home laser printer. It's a hell of a lot of printer for that price and by far the best deal on a colour laser around at the moment. The only drawbacks are that it's quite big and it doesn't have wi-fi, (just ethernet and USB). It's fast, quiet and feels solid. I bought one a few weeks ago for £179.99 (less the cashback, which was paid), and although I needed it then and couldn't have waited, I am still feeling slightly gutted! Excellent deal - a lot of printer for your money. If you want to print …Excellent deal - a lot of printer for your money. If you want to print packing labels once a week then steer clear. If you want it for business use or high personal use demand, go for it. Out of genuine interest, why? I thought for less use a laser is better as the toner doesn’t dry up or go “off” like the ink in the inkjets that always seemed to be dry or crusty if left a few weeks ? Are the cashback handled by HP? Mate, its a Samsung printer, so Samsung will be handling the cashback. Out of genuine interest, why? I thought for less use a laser is better as …Out of genuine interest, why? I thought for less use a laser is better as the toner doesn’t dry up or go “off” like the ink in the inkjets that always seemed to be dry or crusty if left a few weeks ? Inkjet is great for photo printing but cartridges need to be used or you risk blocked print heads with dried ink. Laser is rubbish at photo printing but more expensive on the toners. However toners don’t really have a shelf life (note: manufacturers say otherwise). So yes, for low printing usage, laser is arguably better. If you’re not printing pictures, there isn’t a huge need for a colour one either making your print costs much cheaper. In summary, I guess the markets changed. Laser printers used to be very expensive to buy thus lots of people went to inkjet but that’s not necessarily true anymore. My personal view - in all situations I’d buy a laser unless your wanting to print photos for framing. Happy for anyone else to up my knowledge and recommendation? Does this come with the ridiculous 1year warranty only, as from other sellers? Excellent deal - a lot of printer for your money. If you want to print packing labels once a week then steer clear. If you want it for business use or high personal use demand, go for it. So yeah - could be a decent buy! They're actually amongst the cheapest for a colour laser printer, …They're actually amongst the cheapest for a colour laser printer, particularly if you buy the high capacity, 6000 page ones. £60 (genuine OEM, from Cartridge People) for a 6000 page black toner cartridge is a good deal!This is a workhorse of a printer, designed for far more output than a standard home laser printer.It's a hell of a lot of printer for that price and by far the best deal on a colour laser around at the moment.The only drawbacks are that it's quite big and it doesn't have wi-fi, (just ethernet and USB).It's fast, quiet and feels solid. I bought one a few weeks ago for £179.99 (less the cashback, which was paid), and although I needed it then and couldn't have waited, I am still feeling slightly gutted! I agree for exactly the reasons you state. I got a RICOH SP C250DN PCL 6 from ebuyer in July 2017 for £50.00 Color laser+Duplex+ Wifi. A steal. Still using the shipped cartridges. Always ready to print. I average 1.5 pages a week! TLDR, Samsung are no longer making printers. They bailed out in 2017. They licensed the name to Seagate. Are the toners that come shipped limited capacity? - good for a hundred pages or so and then you have to buy a proper set ? https://www8.hp.com/us/en/printers/samsung.html?jumpid=va_4cd1eif2pxTLDR, …https://www8.hp.com/us/en/printers/samsung.html?jumpid=va_4cd1eif2pxTLDR, Samsung are no longer making printers. They bailed out in 2017.Samsung doesn't do hard disk drives as wellhttps://www.seagate.com/gb/en/support/by-product/samsungThey licensed the name to Seagate. So yes HP will be handling the cashback. HP took over Samsung's printer section. Are the toners that come shipped limited capacity? - good for a hundred …Are the toners that come shipped limited capacity? - good for a hundred pages or so and then you have to buy a proper set ? The included toners do 1500-2000 pages IIRC. Edit: I checked. The colour toners are 1500 pages, the black is 2000. I agree with this. As long as laser toner is not exposed to light, excessive heat or excessive moisture, it's very long life. Unless you want to print photos, laser is better for sporadic use in my opinion. However, if you craft and want to print on specialist papers or mediums, such a t-shirt transfer paper or printable magnetic paper, make *certain* the paper you buy is laser compatible. Many inkjet papers are unsuitable for the high temperatures used to fuse laser toner. Maybe in terms of practicality. I bought the Brother that was on offer a couple of months ago. Great machine, but it's about the size of a 21" CRT telly and probably heavier. Would this be good for printing colourful art prints? I would want to experiment with matte/different papers. Would this be good for printing colourful art prints? I would want to …Would this be good for printing colourful art prints? I would want to experiment with matte/different papers. Try printing a photo off on your colour printer at work to see why. Lasers are rubbish for photos, colours tend to be darker and with lower saturation than they should be. They also have an unpleasant mattte shine. Colour lasers are more for printing letterheads, labels and that sort of thing. They aren't as good as professionally printed items, and no cheaper, but they are more convenient. I work for an NHS Trust that has decided to print the Trust logo rather than use letterheads. Looks bloody awful, especially as they've managed to find a horrible low-res image for the template. However, I suspect Ricoh, the printer supplier, has convinced them it is the best thing since sliced bread. Good question. It’s certainly an argument I’d use for friends and family (a …Good question. It’s certainly an argument I’d use for friends and family (and have!) Inkjet is great for photo printing but cartridges need to be used or you risk blocked print heads with dried ink. Laser is rubbish at photo printing but more expensive on the toners. However toners don’t really have a shelf life (note: manufacturers say otherwise). So yes, for low printing usage, laser is arguably better. If you’re not printing pictures, there isn’t a huge need for a colour one either making your print costs much cheaper. In summary, I guess the markets changed. Laser printers used to be very expensive to buy thus lots of people went to inkjet but that’s not necessarily true anymore. My personal view - in all situations I’d buy a laser unless your wanting to print photos for framing. Happy for anyone else to up my knowledge and recommendation? That seems a reasonable move, although I guess it depends on what your definition of rubbish is. Also it depends on your budget. Laser printers can outperform inkjet printers (especially those tri-colour only inkjets!). Okay, it's probably best to point out that on a budget colour laser printer printing out photos will not be on a par with what an online service can do. Personally I'd get my photos printed via some online service and colour laser print everything else. Reason being reasonable dyesubs are expensive and limited in output size, 6 colour inkjets (and more!) exist, but are very expensive - much easier to have a online service print them for you! Also if you feel the need you can refill toner cartridges - sadly though you'll need chips for this models toner carts, the toner itself is about £5 per colour and the chips are around £5 each. Thanks OP. My son asked me if we could get a colour printer a couple of days ago for his homework... perfect timing. Also, quidco have a £2.50 bonus ATM. This day and age and with such big size no Wifi connectivity kills the deal for me. Not voting either way. This day and age and with such big size no Wifi connectivity kills the …This day and age and with such big size no Wifi connectivity kills the deal for me. Not voting either way. WiFi->ethernet bridge is about £13 from Amazon or eBay. If this is plugged into your network via etherbet will it simply appear as another device on the network anything else on the network can access? Thanks to all the HUKD mates... My first deal that hit 500. If this is plugged into your network via etherbet will it simply appear as …If this is plugged into your network via etherbet will it simply appear as another device on the network anything else on the network can access? An excellent looking printer, even with the refill toner kits you are looking just above 60 quid. I still use the old and trusty Dell 1760nw but now discontinued, entire kits cost 14-18 quid or 2 black high yields and full colour set for 25 quid. Has wifi/network also, but it looks half the size of the this samsung but no duplex. 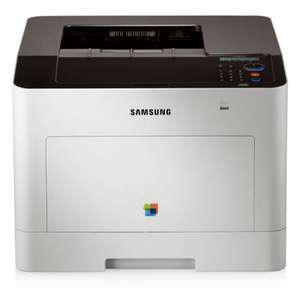 This samsung is still pretty decent choice though with the cash back so a bargain really, still don't believe the 3K figure, my toners say 2K but frankly lucky to get 200-300 colour print outs. Does this support air print from mobile phone? I love Samsung products, but their printers are supported by HP and as such have the worst customer service I have ever experienced. We bought 2 of their colour laser printers for our office, within 3 months one had stopped printing in colour. HP would not replace the printer but insisted that they sent out an engineer to try and fix it, he failed, but ordered extra parts for it, then came a second time, but the parts hadn't turned up, the 3rd time he got the colour working, but then everything had colour bands across it (even if we printed in B&W). In the end (after 3 weeks without a working printer) we got an independent engineer to come and fix it, works fine now. HP wouldn't even reimburse us for the the half ream of paper they used testing the printer every 5 mins or the 25% of toner cartridges they used, not to mention the time I had to spend on the phone to them or the disruption to the charity I work for. Apparently their warranty covers on site repairs, but not replacement until one of their contracted engineers has carried out repairs and failed 3 times (apparently 2nd time didn't count as he didn't have the parts). The engineers are the greatest either, on their first visit after an hour of trying various different diagnostics and head scratching, I asked if the colour toners had a separate motor to the black, to which their response was "Yes, in fact I thought it might be that", which is when they decided to order the new motor. During their 3rd visit (with the new motor) it took them 3-4 hours to completely dismantle the printer in my office and rebuild it with the new motor inside, unfortunately while that fixed the issue of no colour printing, it also created another (the colour bands), however this may have something to do with the number of screws left over after they had put it together (which we are still finding under desks). Shame as the actual printers are good quality, the only real problems start when something goes wrong and you have to deal with HP customer services, and that's only if you can find a number for them and get through. I recommend you avoid Samsung printers & HP too given their lack of customer care. Errrm as its connected via the router or switch, any wireless device will see it. But not having a wireless module means it does need access to a network cable. Also you will miss wifi direct. Can do that but of course it would need wifi direct to make it worthwhile. From a security point of view a wired ethrnet printer is better than a wireless one, unless you need wifi direct.